Consumers have more choice than ever when it comes to headphones these days. From high-end audio companies that have been around for years to newer celebrity-backed brands, there are makers of cans for every price, type and sound. I think most are like me when it comes to headphones. While I appreciate good sound, I don’t have a particular need for true studio reference headphones. Instead, I want reasonably accurate, dynamic sound without paying a very expensive price. I was impressed to find that the one-fits-all free Apple EarPods included with my recently purchased iPhone 5s fit that criteria, obviously in the price department and surprisingly in the sound. Designed to better suit all ear shapes than their forerunners, the famous EarBuds, the Apple EarPods’ greatest weakness is amazingly not their sound quality. While lacking the depth of better cans, they are pleasingly clear and well-defined, having great low-end bass. Instead, your mileage may vary depending on your tolerance for the EarPods’ shape. It’s been an incredibly long time since I’ve worn EarBuds, but it seems reasonable just from looking at EarPods that they are more comfortable to wear for long listening periods. However, they are not comfortable enough to replace headphones that can afford more ergonomic design and materials due to actually costing the consumer something. Apple was limited by the constraint of designing a freebie for hundreds of millions of iPhone buyers, which is evident from the slight ear strain you’ll feel after as little as 15 minutes. Still, EarPods remain a convenient and acceptable solution in certain situations. In-ear headphones, of which type are EarPods, are not my favorite form factor but are ideal for some uses. Thus, I’m glad to own a pair at no cost. When exercising or otherwise sweating in hot weather, the almost weightless, plastic EarPods are near perfect. When outside in any weather, I often wear brimmed hats, and in-ear is the only option. But these occasions only factor into half of my time. For the other half, I’m very happy to own the exceptional and highly-recommended P5 “Mobile Hi-Fi” on-ear headphones from legendary British audio experts Bowers & Wilkins. B&W have managed to strike the perfect balance of premium/affordable with their product design and natural/dynamic with their sound engineering in the case of the P5. In fact, the P5 is so wonderful, it has become something of a modern classic nearly 4 years after its release. If I were to provide the top reason for paying $300 for P5, I would have a hard time choosing between “sound” and “comfort.” A very close second reason would be “aesthetics.” The fact that these three things are in such close competition as the top reason for paying $300 is a real credit to B&W. Let me break it down. Sound – P5 is the perfect audio experience for mobile devices. They bring out the details in compressed audio without amplifying the imperfections of the compression. They make audio sound natural, true to its original recording, yet remain exciting. They isolate sound while preserving a sense of the world around you without leaking. Comfort – The only materials you touch on P5 are metal and leather. 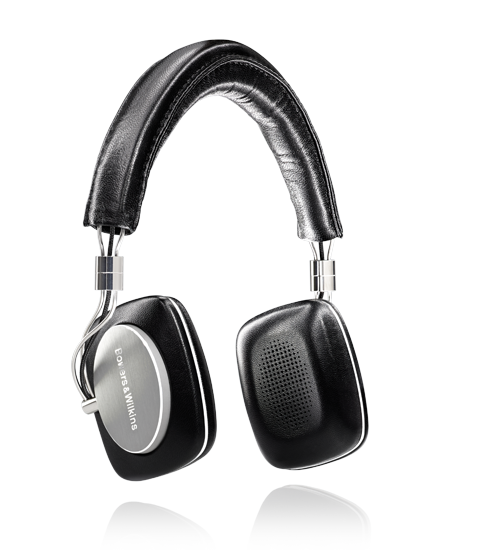 The metal forms an adjustable headband covered with soft sheepskin leather that situates leather ear pads containing memory foam. The only pressure on your ears is slight so as to keep the ear pads in place. The comfort level of the P5 could be described as “forgettable” in the best way. They can be worn for hours without consideration. Aesthetics – Even ignoring the superb function of P5, they look fantastic. They are extremely attractive in either “black” or “ivory” leather, with the raw silver of the aluminum and stainless steel complimenting strikingly. The attention to detail on these things is breathtaking, from the brushed texture and chamfered edges of the aluminum, to the curve and glint of the stainless steel gimbals. Even competing with headphones whose purpose is purely fashion, P5 emerges triumphant. No matter which environment I find myself enjoying audio, I have a headphone well suited. If I were to pit EarPods and P5 against each other, it would be more of a competition than initially expected because they are so ideal for their respective uses. EarPods are the perfect on-the-move, basic headphone when active and P5 provide the sumptuous aural experience when you’re ready to focus on your sound. What’s great is if you’re an Apple user, you only have to pay for one headphone. Make that headphone P5. You won’t regret it. By the way, if you fancy in-ear headphones more than I do, you could buy B&W’s $170 C5 headphones instead and get comparable audio to the P5. B&W also sells a flagship over-ear headset, P7, for $399.